Stack up your money and get ready to spin your way into butterfly oblivion with Netent’s slot game Butterfly Staxx. This slot game is perfect for you if you’re a new player, looking for something a little feminine with easily triggered special features to play. Butterfly Staxx is a five reel and 40 pay-line slot machine available on desktop, tablet, as well as most other mobile devices. 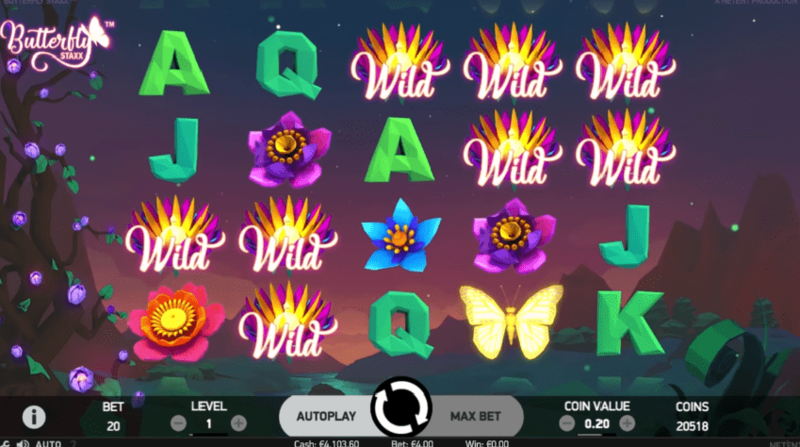 With a medium volatility and an RTP of 96.80%, this slot game won’t send butterflies to your stomach but it should keep you entertained for long enough. The min and max bets players can play range from 0.20 to 400, depending on the currency played. The maximum pay on a single pay-line is 600 coins. 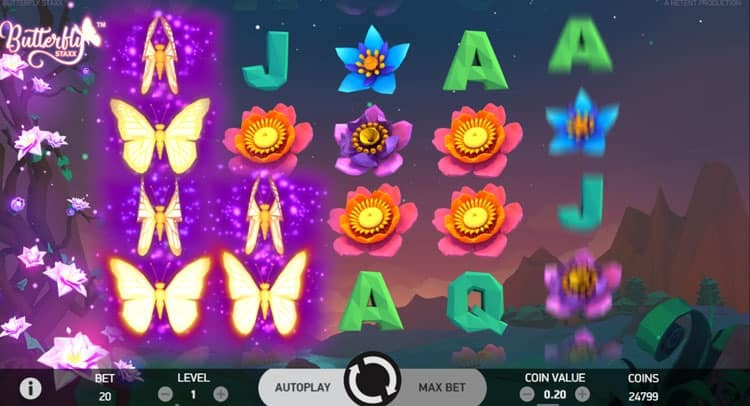 As the name suggests, the slot game’s theme is all about butterflies. A tree with luminescent flowers stands on the right-hand corner of the screen. The background shows an animation of a beautiful panorama. The high-value symbols on the reels all relate to the theme. The symbols in Butterfly Staxx feature three colourful flowers plus a sparkling butterfly which appears stacked on the reels. J - A make up the low-value symbols. There is also a green cocoon symbol which only lands during the bonus feature. The scatter symbol is a purple flower with the word “scatter” on top. The wild symbol is a golden flower with the word “wild” on top. The wild symbol can substitute for all other symbols except the scatter. When it comes to special features in Butterfly Staxx, you will notice that there are only two, similar to each other. The first is a re-spin featuring sticky wilds that will stay on your reel for the remaining number of re-spins. The second is a number of Butterfly Staxx free spins. This feature triggers every time the butterfly symbols cover an entire reel. All butterfly symbols on the screen will move to the leftmost reel and a respin will start. This means that during the re-spin, the first reel will be completely stacked with Butterfly symbols. And if there are any more Butterfly symbols on the reels they will fill the second reel, the third, and so on. Butterflies will be locked in place for the duration of the feature. If more Butterfly symbols land during the re-spin, they will also progress towards the left. The re-spins will continue as long as Butterfly symbols keep landing. When no more Butterfly symbols land on the respins, or if the player covers the entire screen with Butterfly symbols, the feature will end. At the end of the feature the player will get a win depending on how many butterfly symbols landed. Players can trigger the bonus by landing three or more, scatter symbols simultaneously anywhere in view. The number of spins depends on the number of scatters. During the bonus spins, only green cocoon symbols land on the reels. On each free spin, a random number of glowing cocoon symbols will hatch into Butterfly symbols. The Butterfly symbols that hatch will move to the leftmost reels. Butterfly symbols stay locked in place for the duration of the bonus. On each free spin, players will get a win equivalent to the number of Butterflies that have hatched. Obviously, the last spin will produce the biggest win. What we did like about Butterfly Staxx is the free spins round which stood out quite a bit from the crowd. 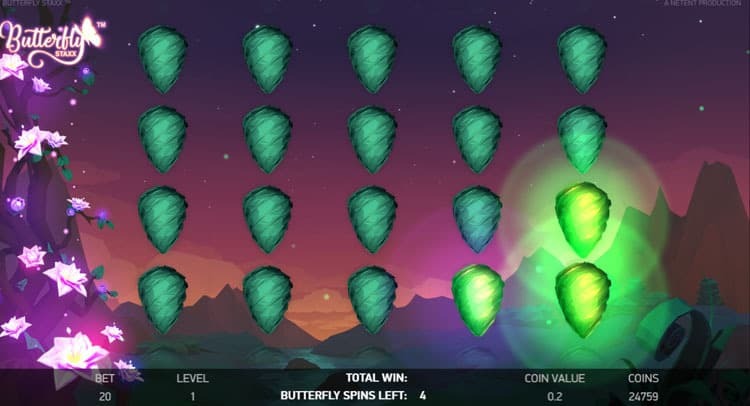 All you have are cocoons that randomly glow and turn into butterflies; these sticky wilds then stay on your reel for the duration of free spins. What we did not like was the lack of special features present. Having said that, the features are fairly easy to trigger.